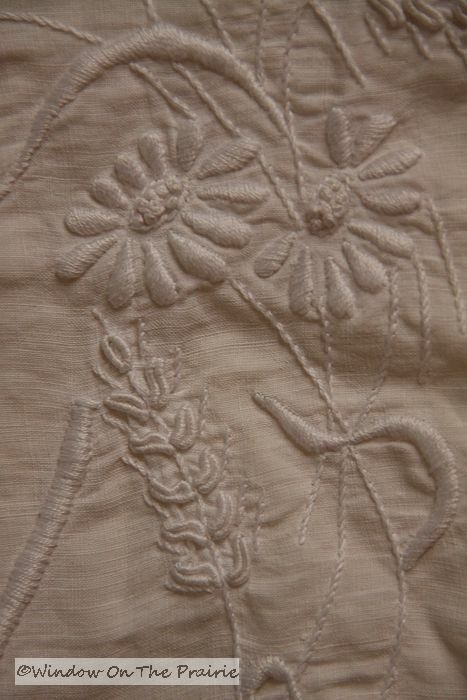 and the other with a white embroidered design of daisies and wheat. I also got a dresser scarf with embroidered baskets of flowers on each end. Lastly, I got two pillowcases with embroidered floral designs on the edges. These will be used for the guest bedroom. And, AND, for all this what did I pay, I ask you dear reader? Nah. Try less than $20 – for ALL of it. And now, pass me my Queen of Antique Shopping Crown please. I love getting a bargain. But what I love even more is owning a piece of history. I stare at the lovely hand-stitching, and wonder about the women who made these. I can picture a girl just learning to do embroidery. Or maybe a young mother sitting by her baby’s cradle crocheting by lamplight. Or maybe an older lady hands stiff from a life’s work of labor but still able to create a field of daisies and wheat with needle and thread. I’ll always treasure these, and remember the women who made them. Beautiful, and what a bargain! 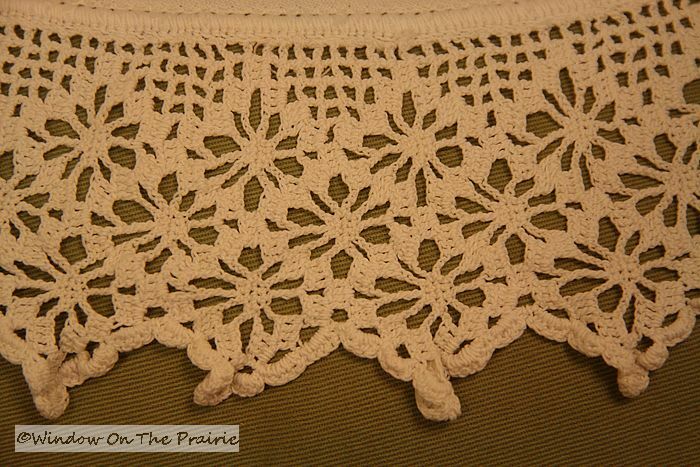 I have a round crocheted dining table covering that my grandma made. I treasure it dearly! Linens are my favorite. No one makes them anymore. They are so fragile, so to be fortunate to own one is a treasure. Nice! You got a good deal too. 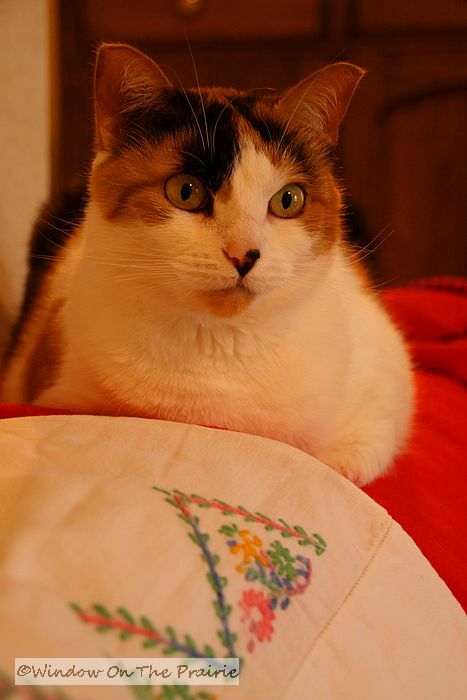 I love to embroidery but cannot crochet. I actually paid a little old lady that I met in a waiting room (that was crocheting a mile a minute)to make me a queen size bedspread. It took about three months and it is beautiful. It is a lost art and I treasure all my pieces too. Wonderful post and great buy! Oh my, those are so beautiful. Makes me want to drive out to Kansas just for some antique linens. 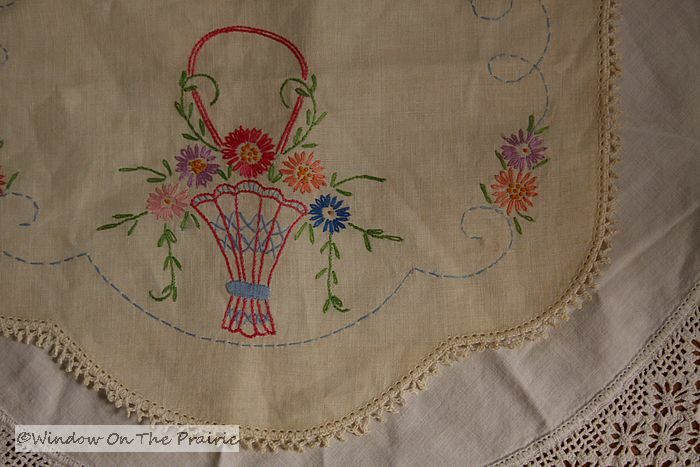 I have some lovely embroidered items from my father’s grandmother, who died well before I was born. I carried one of her blue handkerchiefs during my wedding–something old and blue–and felt a little of family history as I said my vows. (I also wore my late maternal grandfather’s gold wedding ring on my right middle finger…). When my Grandmother wasn’t busy cooking or cleaning, she was crocheting. She took her yarn and hooks everywhere she went. When she saw a pattern she didn’t have, she whipped out her hook and created a sample for future projects. Lucky for me, I have all those samples. Some are framed, and some became tablecloths in my daughter’s dollhouse. No matter where they are, they remind me of my Grandmother, who was still crocheting at the age of 99. I have some old linens also. These are all from my family. Like you I think about the women who made them (some whom I knew and some not) and I appreciate them so much. Thank you for this post. I really enjoyed it. What beautiful items you got and for such a good price! The old linens are beautiful. I have some, too. Most were made by by grandmother. I also have some that were purchased and, like you, wonder about the women who did the needle work. You got a great price for yours. I love old linens, too. Like you, I wonder about the women who made them. Luckily, I have several items made by my skilled grandmother. You got a great price for yours. How lovely! Do you have any secrets for getting rid of yellowing on old linens? I have a stack of old pillowcases that I have had some success with, but there are a couple of stubborn ones that would be more beautiful if I could whiten them up again. Good for you on your good deal! I have bushels of old linens and cottons. Tablecloths, napkins, pillow cases. Embroidered and crocheted pieces. A few old feed sacks recreated into tablecloths or dresser scarves (I don’t think you can buy new dresser scarves anymore, can you?) Some treasures from my husband’s grandmothers, some later things from my Mama. Many pieces were bought at garage sales or auctions. I love the printed tablecloths from the 40s and 50s. Another superb antique mall to shop at is the Ottawa Antique Mall in Ottawa, KS. They always have a great selection. It’s one of my favorite antique malls. Nice post, love your “new” linens. But would like to know if your tired of your Kitty yet. 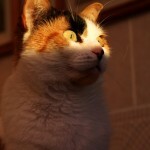 Because I want her, shes so so cute and lovable looking. Would love to just hug her. 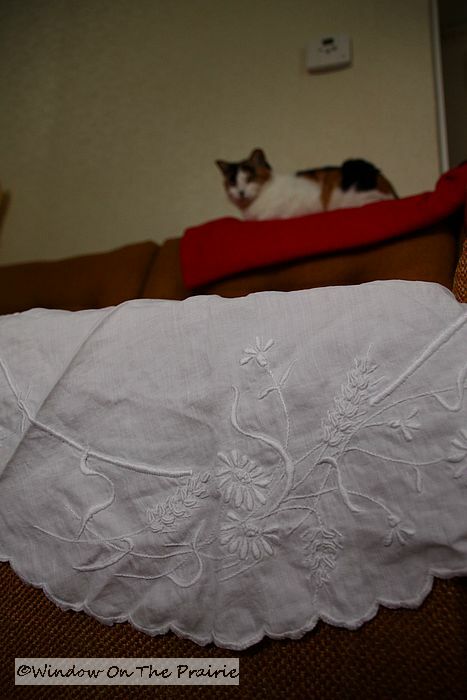 I love old linens – really anything old, really. It’s true that you can’t help but wonder about the women who crocheted and embroidered them…? Same way with quilts. 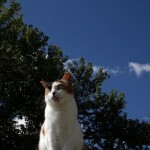 And, as always, LOVE the pics of Kitty Kitty! Don’t you love to catch them in a yawn?! What a find for you. I have a few old linens handed down from my mother’s side. 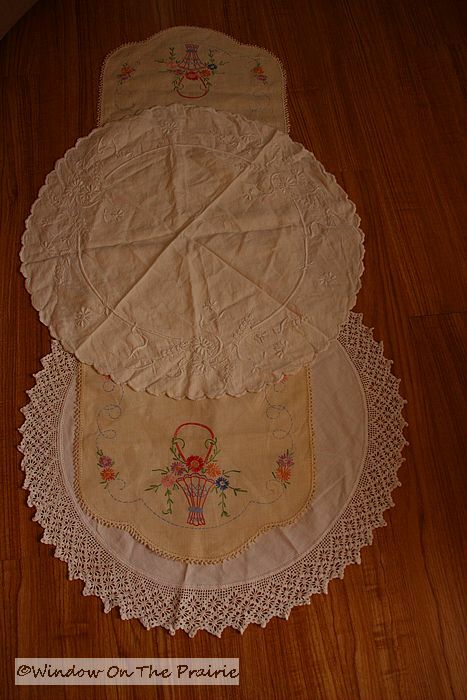 There are two doilys which my great-great-grandmother made; she grew the flax, spun the thread, wove the cloth, made the doilis and crocheted around the edges. They are embroidered with the year – 1816. They will be mounted on dark blue velvet and then framed. Oh my, you know I love vintage linens. I’m the same way about the memories that must come with it. It also reminds me of my grandmother. You did find a great deal. You go girl! Oh Suzanne! I am really in love with these pieces! 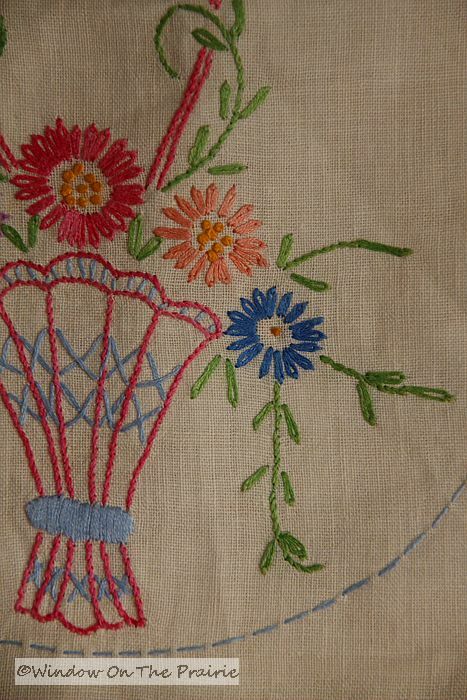 I absolutely love embroidery…especially old stuff! I do a little embroidery myself. I actually find it relaxing. Right now I am working on a piece, but you would think me weird if I told you what I am stitching a portrait of!!!!! 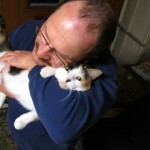 Ok, I will tell you, but try to remember the normal person you see when you look at my blog. Ok? 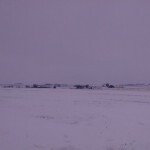 It is picture of Sasquatch. It’s his lovely (ha ha) face with flowers all around and a banner above his head that says “Sasquatch”. I just think the Sasquatch legend is kind of funny and so folkloreish that I kinda love it. I don’t believe there are Sasquatch out there, but just like the quirkiness of it. When I saw a pattern for it on the internet, I fell in love with it and sketched my own similar version. It’s just really too cute and too fun! We don’t believe in Bigfoot either, but we love to watch shows about him as we get such a laugh out of it all. It’s our guilty pleasure. 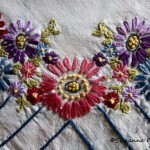 I love hand embroidered items as well. I have alot from my family. I love antique shopping. I went with my sister to a big place this Feb. I wished now I’d bought a photo of an older couple that were just dear. I could have brought them home and enjoyed them. Instant family, is what we label them. Thanks for sharing! I purchased some boxes at an estate sale and one of the items is a very neat old ‘friendship pillow case top. It is about 17 inches square and contains signatures of men and women that were embroidered over.. one side is names only and the other side is names with city,state. All but four are within a diamond shape embroidered area. Cities are Topeka, Valencia, Auburn, Willard and Vonn(?) in Kansas and Kansas City, MO and Watertown, NY. I was wondering about the history and timeframe estimate of this? Gosh, it sounds like such a neat item. I really don’t know the age, but it was probably sometime in the late 1800s, early 1900s. You could check census records, since you have both name and town, it would get you within 10 years of the date it was sewn. If you want help, I’d be more than willing, it’s just the kind of research that I enjoy. These are gorgeous! And it looks like Kitty approves. 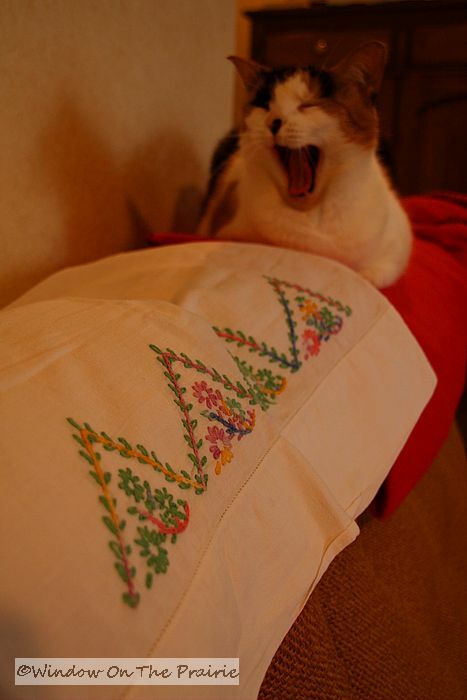 I also “rescue” beautiful vintage embroidered linens from the piles in the shops and bring them home to use. I make my bed up with embroidered pillowcases all the time. And I use vintage tablecloths for tea with friends, or just for lunch for myself. And on my chest of drawers is the dresser scarf made by my Grandmother. I was fortunate to inherit a very large amount of old linens, all embroidered and many with crocheted edges. Many are very old. I use a pair of pillowcases as kitchen curtains, attached with clip-on rings, and I use dresser scarves folded in half and placed over a rod as a bathroom window topper. I have the same exact one you have with the baskets, just different colors. I wish I could display many more, but the pillow cases are too narrow for modern “store-bought” pillows. Ours were homemade from old feather beds when I was growing up. My grandmother and mother embroidered in white on white Indianhead cotton, a heavy linen-like fabric, and they did hemstitching in intricate drawn-thread patterns. How I wish they fit my pillows. I had so much I shared a lot of linens with my sister-in-law, who also loves old things.